Awesome Eels And An Octopus! I think I have the most fun teaching specialty courses. People are enthused to learn more about a certain aspect of diving (which I also have a passion for) and we spend more time exploring the reef. 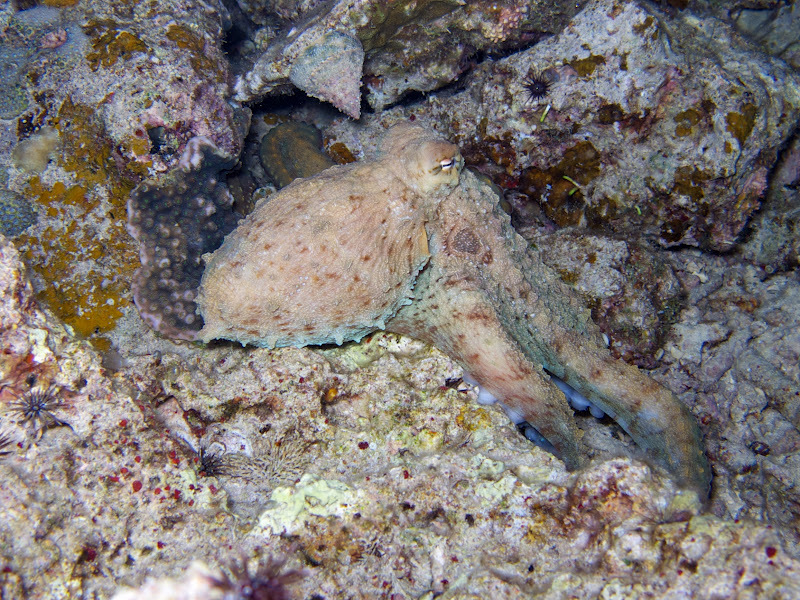 During this night dive at Maeda Point with Kenderick, Erica, James, Morgan, and Josesph, we saw some awesome eels and a really cool octopus. 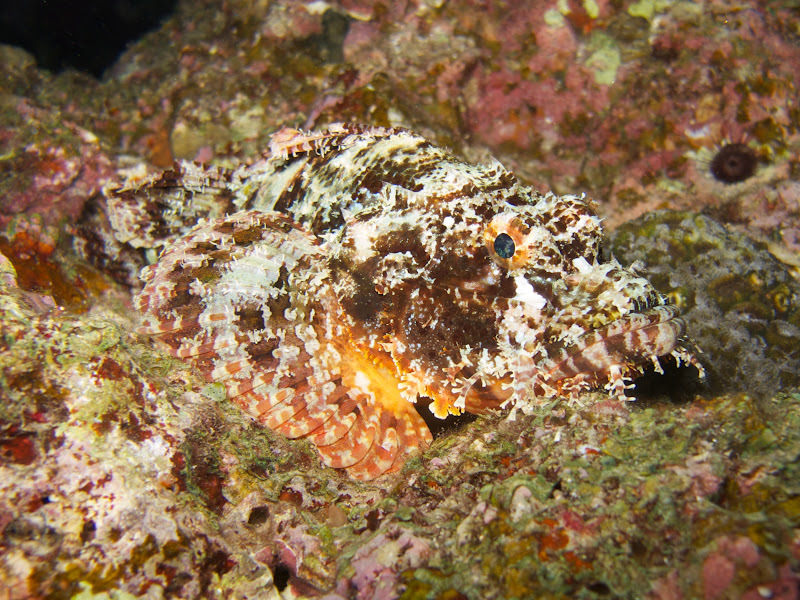 We reviewed our dive plan and then we made our way into the ultra-calm waters at Maeda Point. We slowly followed the chain down to where it leveled off to 20 feet. Signalling to each other that we were all good, I led the group out to the reef wall so we could complete a navigation drill. After completing the nav drill we started off on our exploration of the site by heading northward. 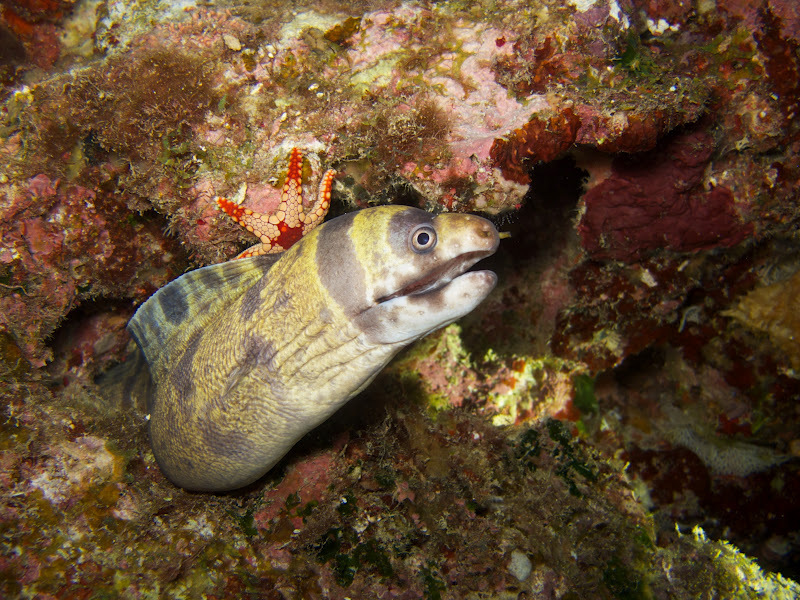 Instantly we started spotting numerous eels poking out of the reef. Erica did an awesome job of picking them out and alerting everyone to their presence. 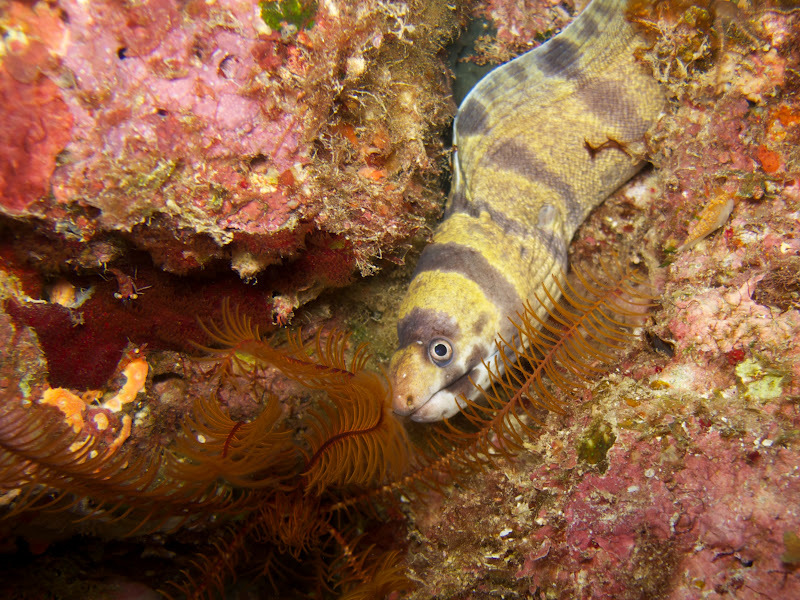 The first found was a barred moray. It was a 1.5 feet outside its hole and it didn’t seem agitated at all by our presence. I swam up to within 4 feet of it and took a few photos and I must say I was rather please with how they turned out. Soon after passing on from the Barred Moray, I noticed Erica was trying to get our attention again. She had swam a little ahead of the group with Morgan and had evidently discovered something pretty good (Erica is an experienced diver and won’t call me over to see something ordinary). I was very curious to find out what she and Morgan had found so I kicked up towards them and got my camera prepped for photos. As I approached I noticed Erica pointing towards an eel sticking out of a crevice. This little guy was a bit more shy than the barred moray we had seen previously. I wasn’t able to get very close or he would pull back into the rocks. The eel kept snapping its mouth in order to get water to pass over it’s gills, and because of this, I managed to get some shots with its mouth wide open. Pretty cool! Also, I still don’t have a species identification for this eel. 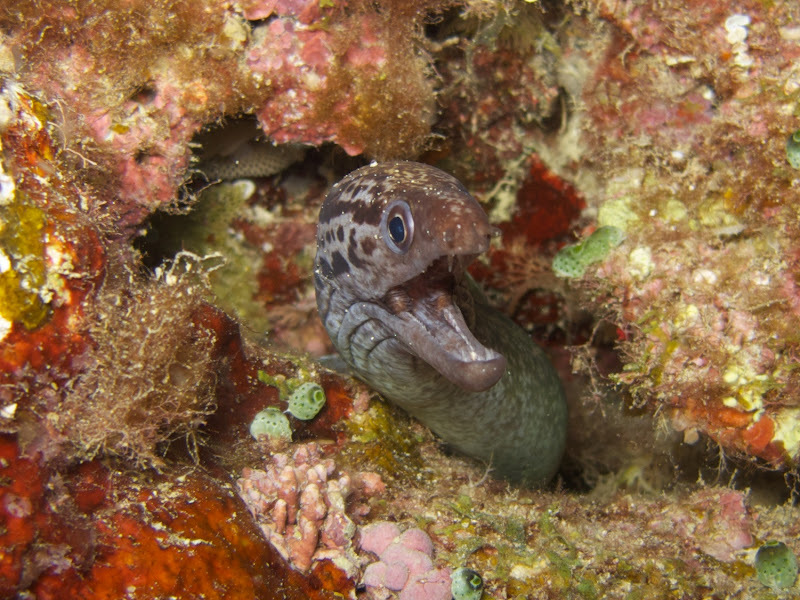 When Erica and Morgan initially pointed out the eel to me I was very excited because this was the first time I had personally come across this type of moray. I’ve posted several requests in various facebook groups hoping for someone to help me identify it but so far I haven’t come up with anything. 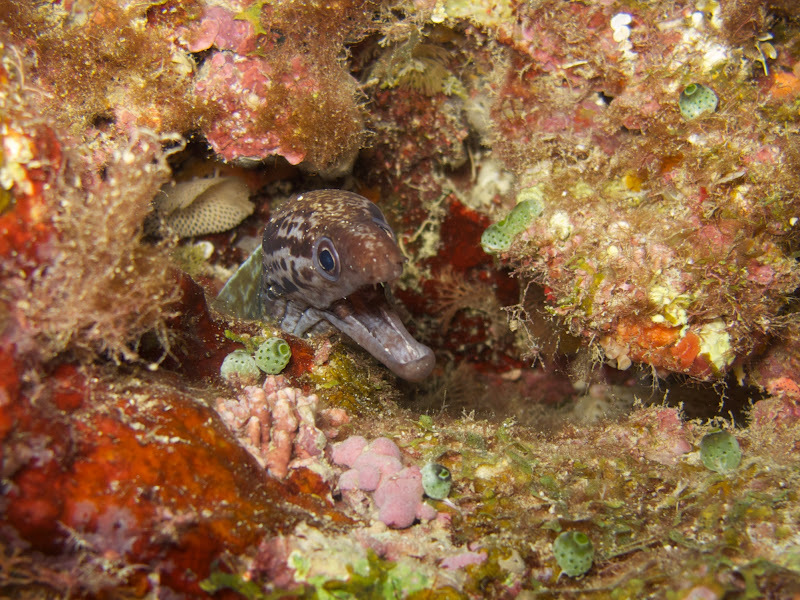 After turning around and heading back to the entrance we came upon the barred moray eel again. 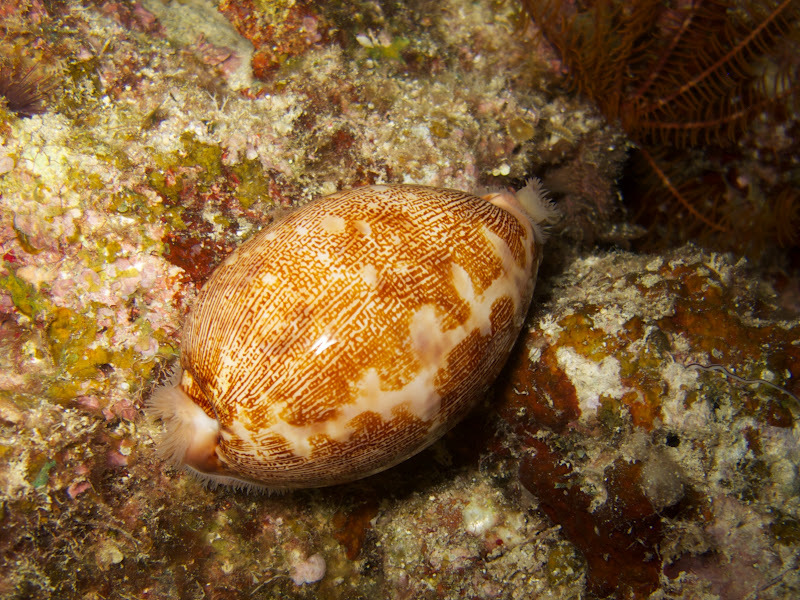 It had moved to a new location on the reef and I took some nice upward looking photos of it. I really like the above photo – the colors look great and the small starfish behind the moray really had colors that pop. When we turned into the the area near the chain we were in for some big surprises. 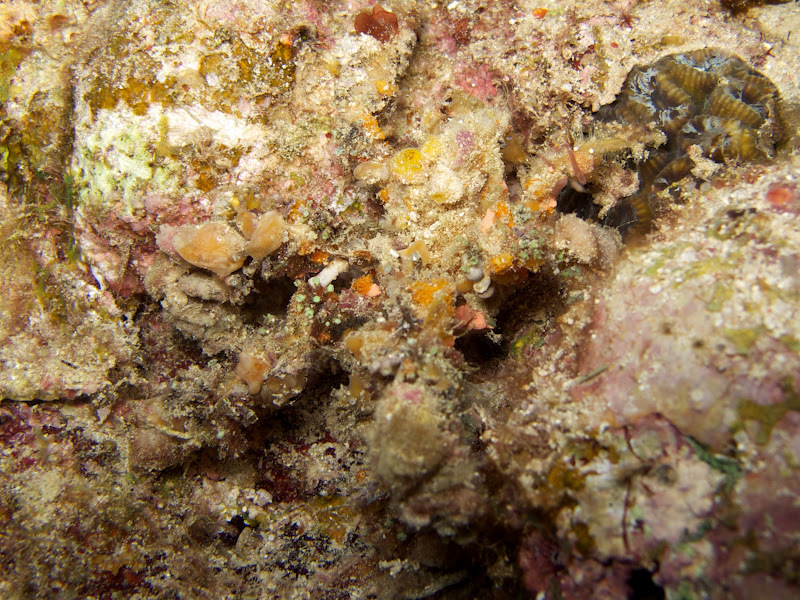 First I spotted what appeared to be a decorator crab. It was blended in really well and it’s difficult to spot in the phot below which I have cropped closely to the animal. If I were to look at this photo in passing, I wouldn’t think there was anything there. We also spotted a Pseudobiceros sp. flatworm crawling across the rocks. I’ve noticed lately there there seem to be more flatworms present at night than previously. 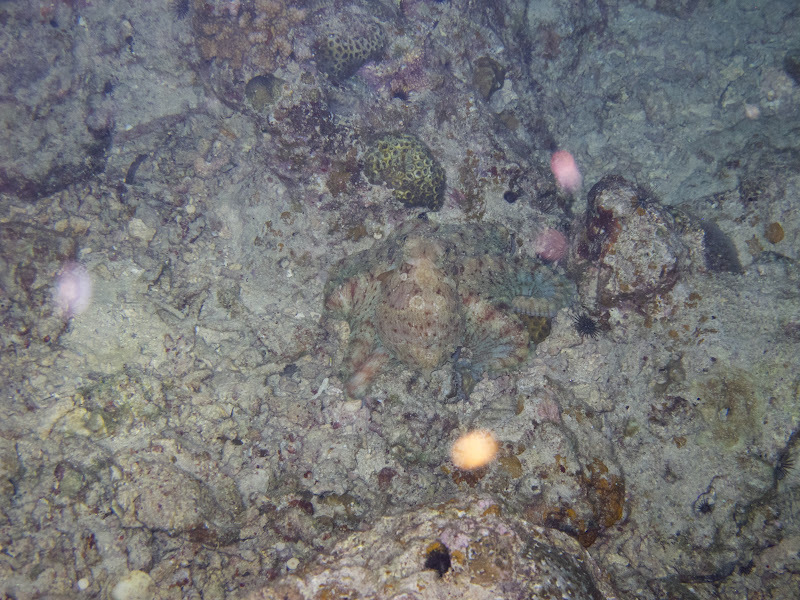 A bit further on I always saw this weird, alien-looking creature scampering across the coral and rocks. I slowly approached and signalled for the rest of the group to come take a look. I nabbed a few photos in the hopes that someone could help me make an identification. 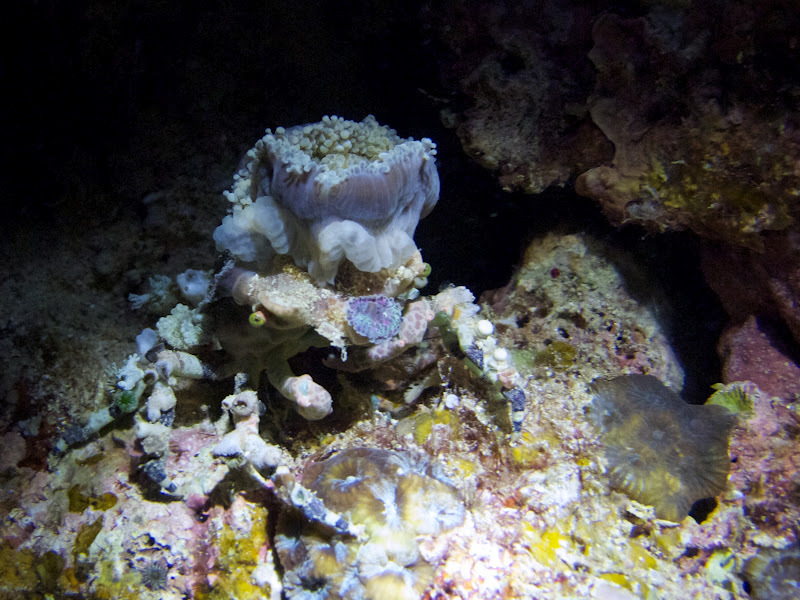 The animal appears to be some sort of decorator crab with a sea anemone growing on its shell. 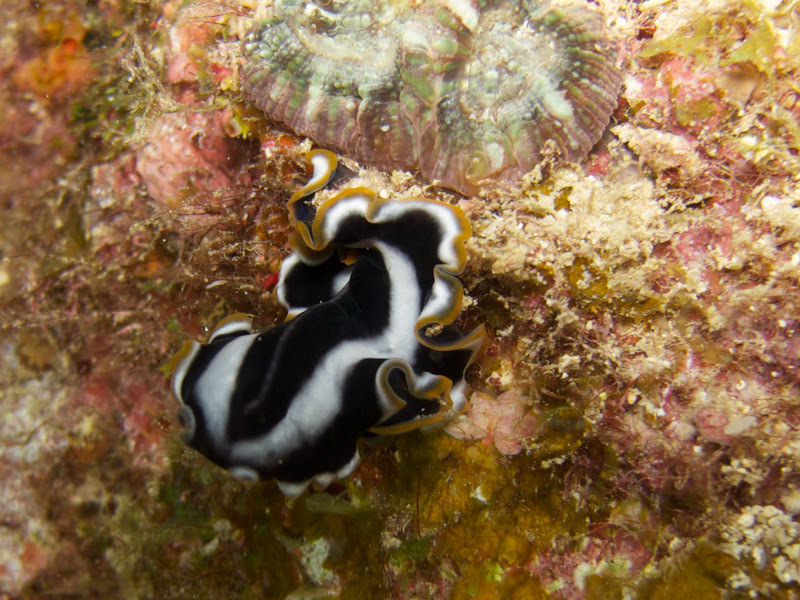 To my great delight, I also came upon a nudibranch. A very rare one at that too! 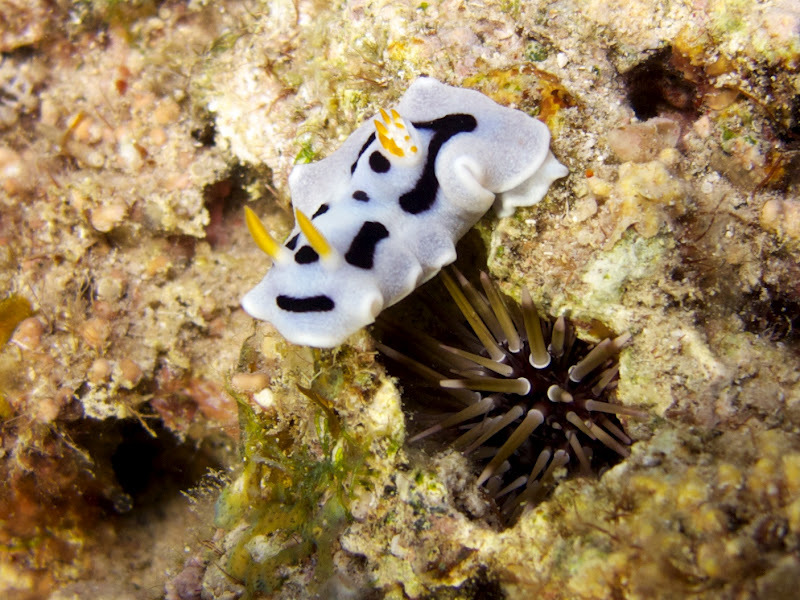 It was a Chromodoris dianae…a species I have seen several times before but it was still cool. I love the colors and pattern on this guy! As I headed for the chain, I saw a light flashing off to my left. I thought it was a little strange because the area near the chain is rather narrow and I didn’t think I could have missed anything too amazing. Well, I was wrong! Kenderick had spotted a really cool octopus and everyone in the group was there to watch it. I snapped several photos and we all kept our distance – we didn’t want to scare it off. After about 2 minutes several members in the group decided to start making their safety stops. Kenderick and I continued to hang around the octopus to see what else it would do, and I managed to get some nice photos of it crawling along the bottom. It was amazing how well it blended in with its surroundings. 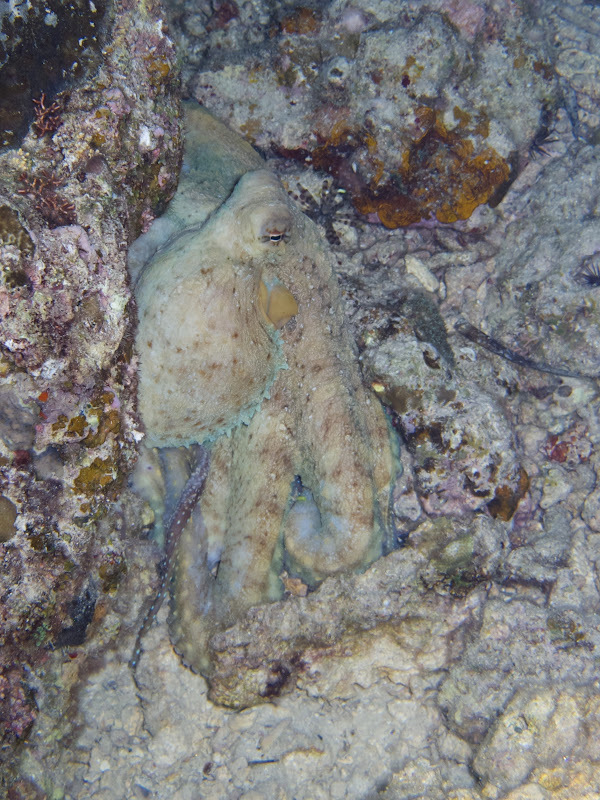 To emphasize how awesome an octopus can camouflage itself, I took the below photo. If you look carefully you should be able to spot it. If you’re having problems, just scroll down a bit more and you’ll see it within a red box. 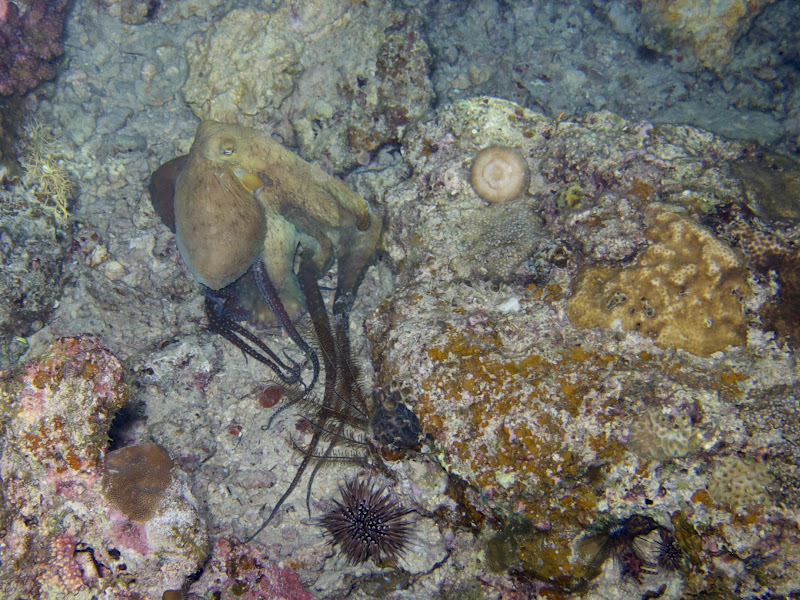 After finishing my photo shoot with the octopus, I came up to the safety stop to join the others in the group. We then slowly made our way onto the surface and started talking about all the cool things we’d seen during the dive.